"I was really concerned because of the thin ice, and then after the cat fell through I knew it was go time. I knew there was short time so I had to act fast." Christmas Eve was a sunny but rather cold day in tiny Hobart, fifty kilometers southeast of Chicago in northern Indiana. It was so cold in fact that an overnight low of 26° Fahrenheit had left a patina of shallow ice on Lake George, a five-kilometer-long mill pond in Deep River. Darden Schurg, a twenty-one-year-old senior and top ranked wrestler at Wabash College in Crawfordsville, one-hundred-eighty-eight kilometers south of Hobart, just happened to be at home with his family for the holidays when disaster struck for a forever nameless orange cat. He and his brothers had just finished eating breakfast and were sitting around the table playing cards when their father looked out the window just in time to see the unfortunate cat fall through the ice. Owing to the brittle nature of it, the cat was unable to gain sufficient purchase in order to extricate itself from the water and therefore was in imminent danger of either drowning or succumbing to hypothermia. The family briefly toyed with the idea of cobbling together an impromptu rescue plan but there simply was not the time for even that. Schurg's unidentified elder brother was the first one to venture into the lake but he quickly abandoned that effort owing to the bitter cold and frigid water. That in turn left the cat's fate solely in Darden's hands. "I was really concerned because of the thin ice, and then after the cat fell through I knew it was go time," he later told the Indianapolis Star on December 28th. 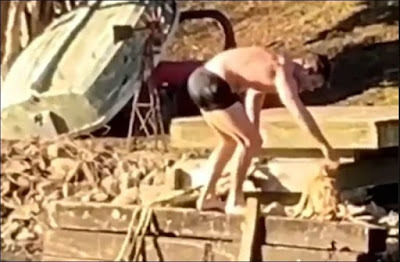 (See "Wabash Wrestler Saves Drowning Cat from Frozen Lake.") "I knew there was short time so I had to act fast." Despite a daytime temperature that peaked at only 34° Fahrenheit, he stripped down to a pair of black drawers and then dived headfirst into the frozen lake. Using only his powerful arms and legs in order to break apart the "sharp as glass" ice, he quickly traversed the thirty to forty yards that separated him from the object of his compassion. He accordingly was able to swim right up to it, gather it in his arms, and safely carry it ashore. "I could tell he was an outside feral cat 'cause he was kind of growling and hissing at me, but he was too cold to be able to do anything," he related to the Inquisitr of Brooklyn on December 29th. (See "Wabash College Wrestler Darden Schurg Nicknamed 'Aquaman' after Saving Drowning Cat in Viral Video.") "So, I kind of took the hisses and the growling as a thank you." From all appearances, Schurg's heroics came in just the nick of time because it is highly doubtful that the cat could have persevered for much longer. "He was pretty bad. I think he was kind of a little bit frozen. He kind of came out of it (in) a little bit of a shock," he told CBS-TV of Chicago. "He went under the dock and hid for a little bit. He came out and kind of shook off and sat in the sun. The temperature was starting to come back up." The entire rescue was filmed by Schurg's sister-in-law, Hilda, who later posted it on Facebook and by December 28th it already had been viewed more than twenty-five-thousand times and shared an additional four-hundred-fifty times. That in turn not only transformed him into a hometown hero but also an international star. He later was dubbed "Aquaman" in reference to the 2018 science fiction flick of the same name about the mythical ancient Greek island of Atlantis. It was, however, the high praise that he received from his father that pleased him the most. "He was super proud of me," he confided to the New York Daily News. In spite of all the hoopla, he has remained modest and perhaps even a bit humbled by the unexpected turn of events. "I love all the outpouring (of) support, and I'm just so thankful that I was given this opportunity because it's that quick moment in time and you have such a short time to respond," he told CBS-TV of Chicago. "I was just happy that I was in the right place at the right time and able to do the right thing." None of those considerations in any way altered his belated realization that his derring-do had come at a steep price. "My adrenaline did most of the work, but the toughest challenge was the fifteen minutes after I got back inside," he told the Indianapolis Star. "I was light-headed and cold." That is putting the case rather mildly in that his fingers and toes remained numb for hours. Knifing through the ice also had left him with superficial cuts to his face, forehead, hands, chest, and legs. "I didn't realize how sharp the ice was until I had gotten out," he admitted to CBS-TV of Chicago. "I was a little taken aback myself. I looked down, and I was completely covered head to toe in blood." Despite all the pain and punishment that the cold and ice had inflicted upon him, he was far from having any regrets. "I feel like it was just something I had to do," he told the New York Daily News. "I kind of have a small place (in my heart) for animals, and I love wildlife, so seeing the cat kind of bothered me. I just couldn't stand by." "I'm sure anyone in my situation would feel the same way," is nonetheless how that Schurg shrugged off his herculean rescue to the Indianapolis Star. On that point he is dead wrong, however, in that there are not too many owners who would have done what he did in order to have saved their own cats, let alone either a homeless one or one that was owned by someone else. In fact, only two other individuals in recent memory come to mind as having sustained serious bodily injuries while rescuing cats. After all, man's expertise always has been in demonizing and exterminating cats en masse rather than valuing and saving their precious lives. Even Schurg has been called upon the carpet by certain unidentified public officials and forced into justifying his actions. "I took the risk after considering all of my options and ensuring my safety above all else," he told the Huffington Post on December 29th. (See "College Wrestler Leaps into Icy Lake to Rescue Cat.") "I would not recommend trying this unless you are sure of your capabilities. The body only takes minutes to shutdown when introduced to freezing waters." Such thinking and behavior demonstrates conclusively that neither group nor the politicians who so handsomely reward and so strenuously defend them against their detractors believe that the life of any cat is worth saving. Even more telling, they do not even care about the welfare of noble souls, such as Schurg, who attempt valiant rescues of cats and other animals that are in distress. Au contraire, they only care about themselves and their beloved shekels. Being essentially little more than bone-lazy parasites who devote their worthless lives to lounging around on the public's dime, they discourage individuals, such as Schurg, from intervening in such matters out of an absurd fear that they might get into distress. That in turn would necessitate that they might actually have to temporarily forsake their cozy offices, brave the bitter cold, and even get their feet wet while attempting to save the lives of these kindhearted individuals. Despite his simply spectacular rescue of the cat, it did not take Schurg long to undo the tremendous good that he had done. Most outrageous of all, after placing the cat down on the dock in order to dry off he callously allowed it to run off without even taking it to a veterinarian. At the very least, he should have taken it home in order to have given it a chance to thoroughly dry out and for its body temperature to have returned to normal. Hilda later told the Huffington Post that the reason that they did not take either of those measures was that the cat was feral. For whatever it is worth, she additionally claims that the cat seemed to be okay. First of all, absolutely no one can tell on sight with any degree of certainty whether or not a cat is feral. For example, many fully domesticated ones have, for good reason, an ingrained fear of all strangers. Instead of cruelly abandoning the cat that he had risked his life in saving, Schurg should have seized the moment by taking it home and, if needed, socializing it. Speaking more broadly, it is long past overdue that all individuals, professionals and amateurs alike, stopped spreading the malicious lie that there is any such thing as a feral cat. "A cat is a cat and that is that," an early American proverb maintains but instead of progressing the public's intellect on this subject has regressed. Moreover, for shelters to kill homeless cats is no less morally abhorrent than it is for cops and juvenile thugs to beat to death homeless men. Soon after his heroics Schurg returned to school in Crawfordsville and the only public concession that he and his family have made concerning the welfare of the cat has been a weak promise on the part of the patriarch to keep an eye out for it. Such a declaration can only be described as an utterly laughable example of beau geste. Most disturbing of all, it now appears in hindsight that Schurg's rescue served only to prolong the inevitable. Both the capitalist as well as social media have, typically, forgotten all about the cat but it truly would be a miracle if it survived the wave of unstinting extremely cold weather that has swept across Hobart and the remainder of the eastern half of the United States since Christmas. According to data supplied by AccuWeather, the thermometer plunged to 9° Fahrenheit in Hobart on January 21st. The reading on January 24th was 6° F and that was followed by overnight lows of 0° F, -3° F, and 0° F on, respectively, January 25th, January 26th, and January 27th. The reading on January 28th was 11° F but that was followed by -5° F, -20° F, -17° F, and 3° F on, respectively, January 29th, January 30th, January 31st, and February 1st. Unless the cat was able to somehow have gotten inside where it was reasonably warm, it likely froze to death on one of those hellishly cold nights. Even if it had been lucky enough to earlier have secured shelter underneath a building of some sort it is doubtful that it survived the polar vortex that arrived during the last week of January. That in turn means that the Schurgs ultimately are responsible for its death because they alone had it well within their capacity to have alleviated its plight and yet they knowingly and willingly turned it loose to brave the cruel, hard, and unforgiving cold that lay ahead. At the end of the day, half-hearted efforts and acts of beau geste do not count for very much when it comes to saving cats. Likewise, protecting them is not a parlor game in the same fashion that Dame Agatha treated murder. It therefore is imperative they be kept either indoors or provided with heated shelters during the wintertime. They also require a steady supply of good quality meat, water that is not frozen, and access to, if any can be found, top-notch veterinary care. Climate change also is dramatically endangering the lives of cats, especially those that are forced to live outdoors. It therefore is mandatory that practitioners of TNR above the Mason-Dixon line install heaters inside the shelters of the cats that live under their care and control. On the West Coast, wildfires and mudslides are the principal concerns while along the Atlantic and Gulf Coast states hurricanes are becoming not only more powerful but frequent as well. It therefore should be axiomatic that weather that is unfit for humans to be out in is likewise unhealthy for cats but that self-evident reality continues to escape the grasp of most individuals, just as it did the Schurg family in Hobart.